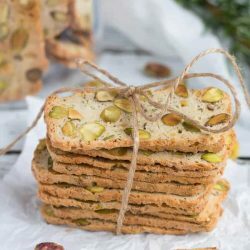 Pistachio, Lemon & Rosemary Biscotti make the ideal last minute present. Crisp slices of nutty bread, with the surprising kick of rosemary. Keep a loaf of cooked dough in the freezer for emergencies, and never be caught without a gift again. Grease a 8.5cm x 19cm loaf pan and line with baking paper. In a small bowl, mix the rosemary and lemon zest into the spelt flour. Set aside. Slowly add the sugar, beating between each addition, until the sugar is dissolved and the meringue becomes stiff and glossy. Sprinkle one third of the flour mixture and one third of the nuts over the egg whites and begin to gently incorporate with a spatula. As egg white is exposed, slowly sprinkle the remainder of the flour and nuts into the bowl. Continue to gently stir until all the flour is incorporated. Spoon the mixture into the prepared pan and gently smooth into the corners. Bake for approximately 30 minutes, or until lightly browned and a skewer inserted in the centre comes out clean. Wrap the baking paper over the top of the log and then wrap in foil. Allow to cool completely. The log can be frozen at this stage. With a sharp serrated knife or an electric knife, slice the cooked loaf into 3mm slices. Place the slices on the lined tray and bake for approximately 12 - 15 minutes, or until the slices are dry and crisp. Remove the slices from the tray and cool completely on a wire rack. Rosemary is not traditional in this recipe, however it compliments the pistachio and lemon flavours, which is why I have included it. If you don't like a strong rosemary flavour then use the smaller amount specified in the recipe. Ensure that you bake the slices for long enough so that they dry out or you will end up with soggy biscotti. If your oven runs hot then bake at a lower temperature for longer. Store in an airtight container for two to three weeks.